To Cite: Shirazi M, Farhadifard H, Moradi M, Golshahi H. Multidisciplinary Treatment of Cleft Lip and Palate: A Case Report, Iran J Ortho. 2015 ; 10(2):e5054. doi: 10.17795/ijo-5054. Introduction: Cleft lip and palate (CLP) is the most common congenital facial anomaly. Its incidence varies according to epidemiologic studies but is usually between 1 and 1.82 for each 1000 births. The etiology of this malformation is complex and includes both genetic and environmental factors. Case Presentation: In this article a 13-year-old girl with CLP is presented. She was treated with expansion of maxillary arch form, bone grafting, pre surgical orthodontics, orthognathic surgery and minor esthetic surgical procedure. Conclusions: Satisfactory results regarding functional occlusion, dental esthetics, and facial esthetics were achieved in the patient. Cleft lip and palate (CLP) is the most common congenital facial anomaly. Its incidence varies according to epidemiologic studies but is usually between 1 and 1.82 for each 1000 births (1). CLP is a congenital deformity that is associated with maxillary sagittal and transverse discrepancies (2, 3). In addition to skeletal discrepancies, this deformity is often accompanied by dental abnormalities, such as hypodontia, hyperdontia, and transpositions (4, 5). Its incidence in Asian population is reported to be around 2.0/1000 live births or higher (6). The etiology of this malformation is complex and includes both genetic and environmental factors (7). CLP patients might suffer from unfavorable smile esthetics and low self-esteem, leading mainly to difficulties in social interactions. The treatment for patients with CLP is challenging because of the difficulties inherent in the deformity, the necessity of interdisciplinary involvement, and the need for good patient cooperation. The results might still be limited even if all of these challenges can be overcome (8). The purpose of this report was to show that an interdisciplinary treatment protocol, after adequate diagnosis and planning, significantly improves the alterations resulting from a bilateral CLP deformity. The proposed objectives of occlusion, normal function, and balanced profile were achieved successfully. 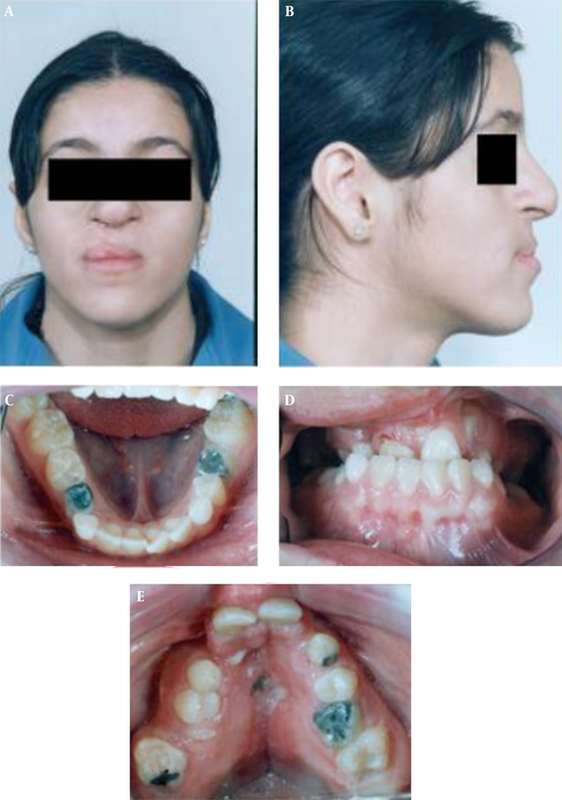 A 13-year-old girl was referred to department of orthodontics of dental faculty of Tehran University of Medical Sciences, Iran with the chief complaint of lip and palate cleft. Clinical evaluation showed bilateral CLP and oroantral fistula. The facial profile was concave with a retrusive upper lip. She was in the mixed dentition and had anterior and posterior cross bite with reverse overjet of 4 mm, and overbite of 4 mm. Maxillary midline was 2 mm deviated to right. 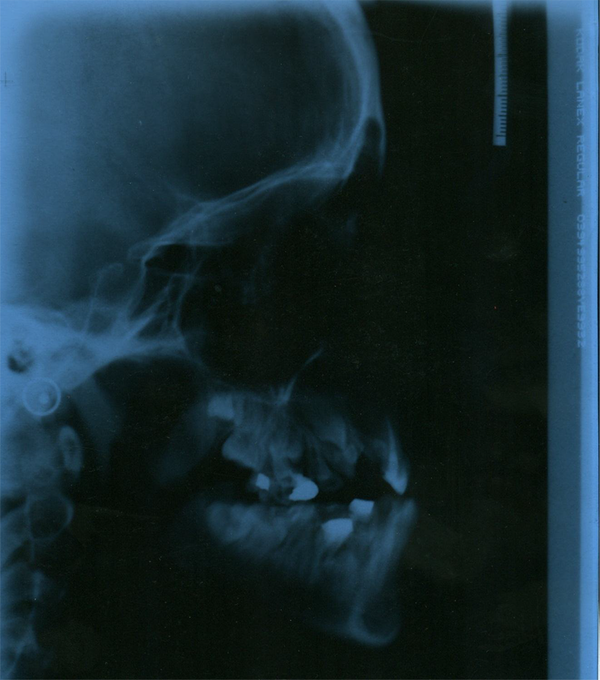 Severe crowding and constriction of maxillary arch were diagnosed (Figure 1). A, Frontal view; B, profile view; C, mandibular occlusal view; D, anterior view of occlusion; E, maxillary occlusal view. Panoramic radiograph findings were mesio angulation of mandibular second molar in left side and root canal therapy of maxillary right central incisor and impaction of maxillary canines and lateral incisors adjacent to the cleft site. The bilateral CLP was clear in panoramic view (Figure 2). Lateral cephalometric findings showed skeletal Cl III pattern, the facial growth vector was normal. The maxillary incisor retroclination led to buccally positioned roots, influencing the contour of the anterior maxillary vestibule; this produced an increased ANB (3 degrees) angle and masked the retrusive maxillary position (Figure 3). The cephalometric measurements are mentioned in Table 1. - Expansion of maxillary arch. - Initial alignment of maxillary arch and then bone graft in cleft site, guiding the eruption of canines and lateral incisors to graft area to enhance bone formation. - Correcting the inclination and angulation of maxillary anterior teeth, and coordination of arches. - Preparing the patient for orthognathic surgery. The first procedure consisted of maxillary expansion with removable appliance at 13 years of age to improve the maxillary arch shape. The rate of screw opening was once a week. Brass wire for uprighting the mandibular second molar was used simultaneously. Reactivation of the brass wire was done in four week intervals. These procedures took about 8 months. Another removable appliance without screw was applied for retention period for about 6 months (Figure 4). A, Frontal view; B, profile view; C, lateral view of occlusion; D, anterior view of occlusion; E, maxillary occlusal view; F, mandibular occlusal view. After retention time, fixed orthodontic treatment of upper arch was started. These wires were used respectively: 0.014 NiTi, 0.016 stainless steel, and 0.018 stainless steel. Later bone grafting in cleft area was performed to promote the bony union of the alveolar segments and closure of the bilateral clefts. To extrude left lateral incisor, box loop was used. After 1 year, fixed treatment of lower arch was started. During this phase, the goals were alignment and leveling, anterior and posterior crossbite correction with aid of surgery, plus improvement of the maxillary incisor angulation and space regaining for maxillary canines and lateral incisors to compensate the alveolar bone deficiency and correcting alveolar cleft. - Extraction of lower first premolars, mandibular subapical osteotomy and anterior set back. 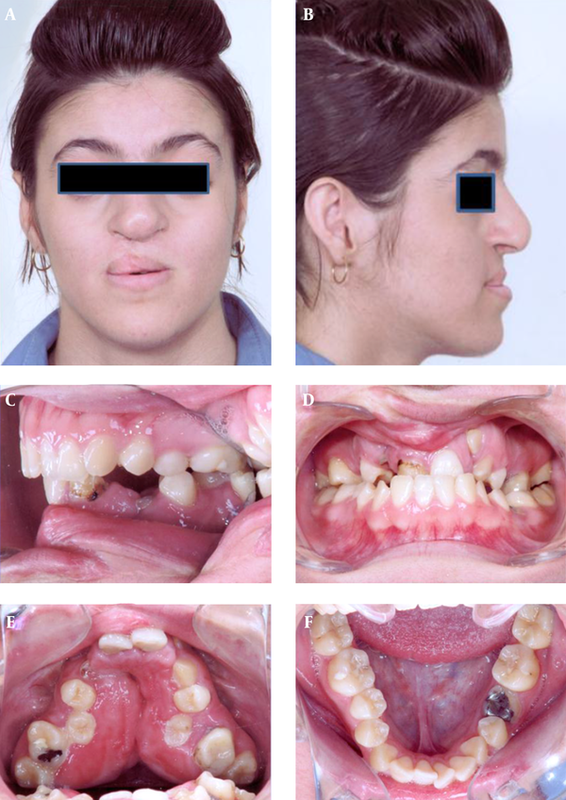 1.5 years after orthognathic surgery, Minor plastic surgery of the upper lip and rhinoplasty were performed during post surgical orthodontic phase to enhance esthetics and function (Figure 5). A, Panoramic view; B, lateral cephalometry view; C, profile view; D, frontal view; E, maxillary occlusal view; F, mandibular occclusal view; G, anterior view of occlusion. The overall treatment objectives were achieved. Esthetic improvement of the frontal and lateral profiles was evident, especially in the profile of the upper and lower lips. At the end of interdisciplinary treatment, which lasted 6 years, the frontal and lateral facial appearances were improved. Paranasal deficiency was improved, and patient’s expected orthodontic outcomes had been achieved. The maxillary constriction and posterior crossbite were mainly solved by orthodontic expansion, and the remaining transversal problem was solved by surgery. After orthodontic treatment, the maxillary and mandibular dental midlines were coincident with the facial midline. The post-treatment panoramic radiograph showed good root parallelism. There was no evidence of root resorption. The maxillary incisors were proclined orthodontically. By the proclination of the premaxillary segment, the A-point moved palatally. But, the SNA angle increased due to the surgery and SNB angle decreased because of subapical osteotomy; and the Wits appraisal increased significantly. The maxillomandibular relationships at the end of the treatment became more desirable (ANB, 6; Wits appraisal, 3) and showed a slight increase of the vertical measurements. Overjet and overbite were 3 mm and 2.5 mm respectively (Table 2). The functional movement of the mandible was normal, and no signs or symptoms of temporomandibular joint disorders were found. Patients with cleft lip and palate have multiple functional and esthetic problems. Only a team approach can provide comprehensive treatment for them. These patients have various skeletal and dental problems. Maxillary constriction and posterior crossbite are common findings in them. There are several options to correct these functional problems: slow or rapid maxillary expansion, surgically assisted orthodontic expansion, transpalatal distraction, and expansion during surgery (9-11). We used slow maxillary expantion for better arch form correction. The main problem with orthodontic expansion is unwanted buccal tipping of the posterior teeth (12). Our patient also experienced buccal tipping of the teeth and maxillary segments caused by overexpansion; although a slight relapse occurred before starting fixed treatment and tooth inclinations were controlled during fixed orthodontic therapy before surgery. Fixed appliances were used to obtain dental alignment and leveling, and to correct the retroclined maxillary incisors. Long et al. stated that the preservation of thin alveolar bone surrounding the dental roots close to the cleft is the main obstacle to anterior tooth movement and crossbite correction (13). Therefore any tooth movement to the cleft area before grafting was prevented. According to Toscano et al. an important factor involved in the stability of the graft is dental age at the time of bone grafting and orthodontic therapy before and after grafting. This indicates the importance of tooth movement to prevent postoperative bone resorption (14). While dental abnormalities are more frequent in patients with CLP than in the general population, but our patient did not have any of these signs. Although the ANB angle (3) at the beginning of treatment did not resemble a skeletal Class III relationship, maxillary protraction was used to correct the anterior crossbite, compensate for any further mandibular growth, and enhance the patient’s profile (15, 16). At the end of treatment, normal overjet and overbite were achieved. Adequate dental alignment and leveling, as well as maxillary and mandibular midline symmetry, were also established. Post orthodontic treatment can be as difficult as the therapeutic portion of the treatment in patients with CLP depending on the type of cleft. In some patients, the treatment often seems endless. This postorthodontic phase of treatment is fundamental, and patients should be aware of its importance. Our patient was cooperative, and the treatment has progressed delightfully. Satisfactory results regarding functional occlusion, dental esthetics, and facial esthetics can be achieved with a well-established diagnosis and treatment plan. As with all orthodontic treatment, long-term follow-up is necessary to maintain the results.